He will serve initially from 13 August 2012 until 31 March 2015. As an independent member, he will receive £11,100 a year for 36 days’ work. Mr Kelly is an experienced executive with over thirty years’ experience in the food and drink sector, and has extensive knowledge of the UK food supply chain. The appointment complies with the Code of Practice of the Commissioner for Public Appointments. He has not declared political activity during the past five years. The ADHB is a Defra sponsored Non Departmental Public Body. It is funded, in the main, by farmers, growers and others in the supply chain through statutory levies and serves six sectors representing 75 per cent of total UK agricultural output: pigmeat in England; beef and lamb in England; commercial horticulture in Great Britain; milk in Great Britain; potatoes in Great Britain and cereals and oilseeds in UK. 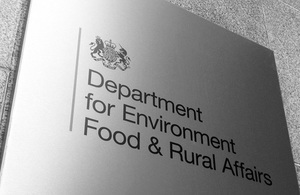 This appointment was made by Defra in conjunction with the Scottish Government, the Welsh Government and the Department of Agriculture and Rural Development for Northern Ireland.